Skye Fortier, Ph.D., was working with a student in late January 2018 when the sharp chirp of his cell phone interrupted their discussion. 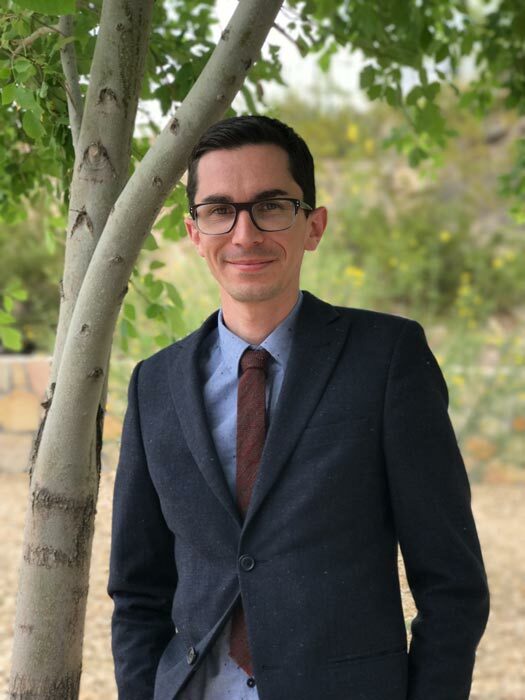 Skye Fortier, Ph.D., of UTEP’s Department of Chemistry and Biochemistry, was named one of 126 winners of the top prize of the Alfred P. Sloan Foundation on Thursday. The fellowship is a highly regarded honor that recognizes early-career scholars whose achievements mark them as the next generation of scientific leaders. The assistant professor in the Department of Chemistry and Biochemistry at The University of Texas at El Paso answered the call. The voice on the other end was Keith Pannell, Ph.D., a fellow chemistry professor. Pannell inquired if his colleague had checked his email recently. Fortier immediately became dismayed. “My first thought was, ‘Oh, this is the email to say that I didn’t receive the award,’” Fortier said. The award in question was the Sloan Research Fellowship. Fortier was nominated by Pannell for the top prize of the Alfred P. Sloan Foundation, a highly regarded honor that recognizes early-career scholars whose achievements mark them as the next generation of scientific leaders. Soon enough Fortier learned he was indeed one of the nonprofit’s honorees for 2018. Fortier is the first UTEP faculty member to be named a Sloan Research Fellow. The list of 126 Sloan Research Fellows was announced Thursday, Feb. 15, with a full-page advertisement in the New York Times. Fortier will receive $65,000 to further his research in synthetic and organic chemistry. The Sloan fellowship is open to scholars in eight scientific and technical fields – chemistry, computer science, economics, mathematics, computational and evolutionary molecular biology, neuroscience, ocean sciences and physics. Candidates must be nominated by their fellow scientists, and winning fellows are selected by independent panels of senior scholars on the basis of each candidate’s independent research accomplishments, creativity and future potential. Fortier was nominated for the prize by Pannell, his colleague in the Department of Chemistry and Biochemistry who was once his research mentor. Fortier worked in Pannell’s laboratory when he was an undergraduate student at UTEP in the early 2000s. Pannell said he knew early on that Fortier would one day showcase his talents in a big way. Fortier said the money he will receive as a Sloan recipient will facilitate the research activities he is conducting to make metal-containing compounds. Fortier said he hopes to develop methods to create organo-metal molecules for new types of chemical reactions and new, low-cost, easy-to-manage catalysts that can be applied to various facets of science. He said the inspiration to use metals comes from nature. Fortier added that the recognition would not have been possible if not for his student researchers.